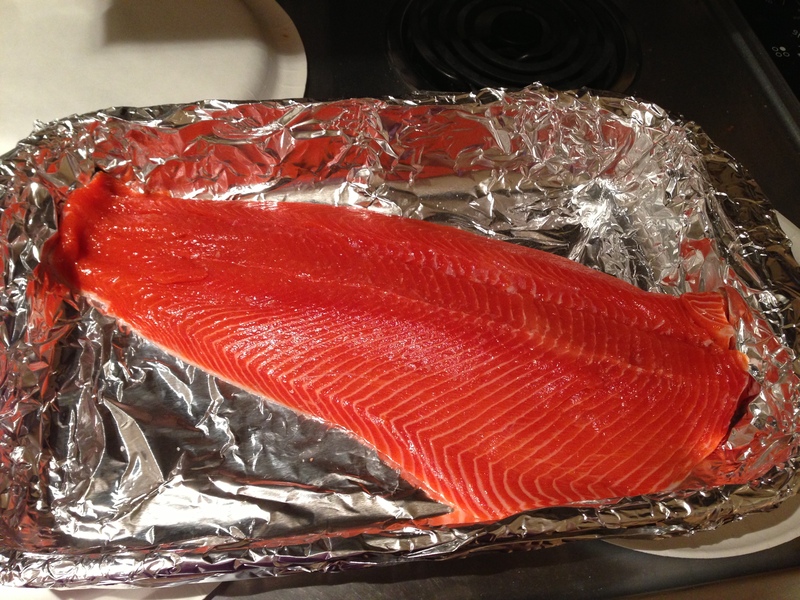 Wild Alaskan Copper River Salmon, ready to cook. Baked with a dash of fresh ground pepper & sea salt & Tillamook butter to make a light brown sauce. (sometimes I bake it with fresh dill or just garnish with fresh dill. I never liked salmon -ever. period. ugh. And for years my guy got every last bite of this fillet mignon of fish while I stayed stalwart in my stubborn, stupidity. Until 2 years ago. Really, I’ve never liked fish because it tastes…er…um…fishy. Well, that night, the poor man was lucky he got even one bite of the entire large fillet! Lucky he kept his fingers off the pan or he could have lost a couple of digits! I caught the fever; was a woman possessed! Seriously, what could I have been thinking? All those years wasted! I mused aloud to the accompanying music of see-I-told-you smiles on the man’s kisser. Such a simple preparation as above pictured and it was delectable! Firm flesh, succulent taste… And it was all gone before he could blink! We were both so happily surprised that we trotted off to Costco the next day and got another packed-that-day fresh fillet. Snob that I am now, I know it’s best as near fresh off the boat as possible. Look for and ask about the pack date. Oh, go ahead; talk to your fishmonger and enjoy the fish tales and info sharing. You’re part of the community once you try it and like it. And p.s. they do have it in New York at Costco too. Close to $13.99 /Seattle $9.99 per pound once into the season. Way down from anywhere from in between those numbers and $40 per pound at the very beginning of the first runs to hit market in May. When thinking about how to cook this fabulous fish, I’m still such a newbie aficionado that I can barely bring myself to do anything which might cover up the flavor of this chateaubriand of the purest river around. 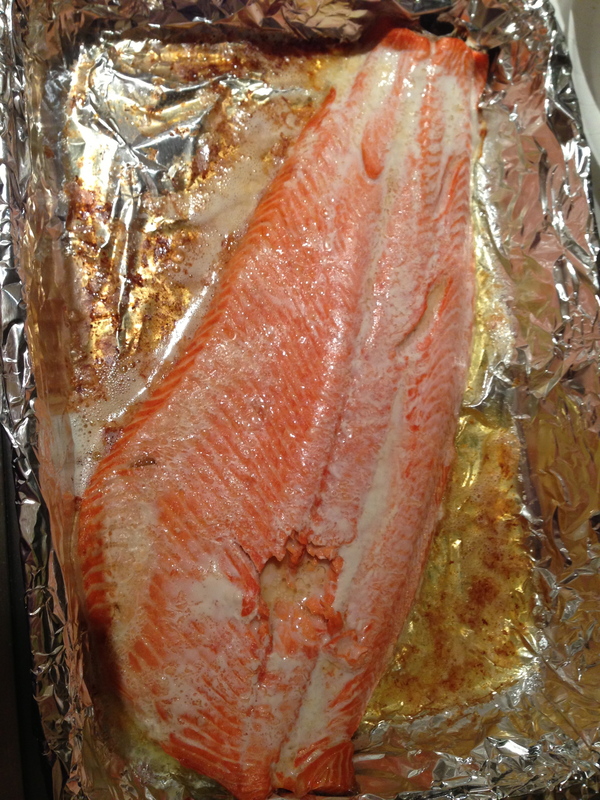 I have added, both in baking and broiling and after-plating, Chef Paul Prudhomme’s Magic Salmon Seasoning which has dill, granulated garlic, onion, mustard seeds and paprika and that was deliciouso! And fresh dill of course with the brown butter is yum with quick pan sautéed fresh green beans in a bit of butter, olive oil & a sash of fresh ground pepper and sea salt…sometimes garlic. I might be tempted into a soupçon of truffle oil on fresh veggies or yukon gold fingerling potatoes. Really the sides are kept to a minimum because it is the main event I crave. Yes, you heard me…. cra-crave! I’m practically booking flights to Alaska to go do what another blogger was thinking of doing…standing at the shore when the boats come in and kissing those fishers of fabulousness with gratitude overflowing for the bounty of creme de la creme gourmet fare. Though I still don’t much like the grey, near the skin, part of the salmon, I absolutely kvell (gush) and profusely express gratitude for every exquisite fishy that crossed from the pristine Copper river to my plate. It is a sacred moment as I thank that fish which gave its life for our most immense dining pleasure and sustenance…and for its grace and beauty and out of this ever living world 10 star sweetness! I bless the river, the salmon and the people who bring them to our stores and tables. It truly is a labor of love all around…the keeping the river healthy for the fish; the keeping the fish safe and bringing them to market; to our creativity in the kitchens and to our tables to ooh and ahhh over; as we bless, love and express our gratitude for such superior bounty. 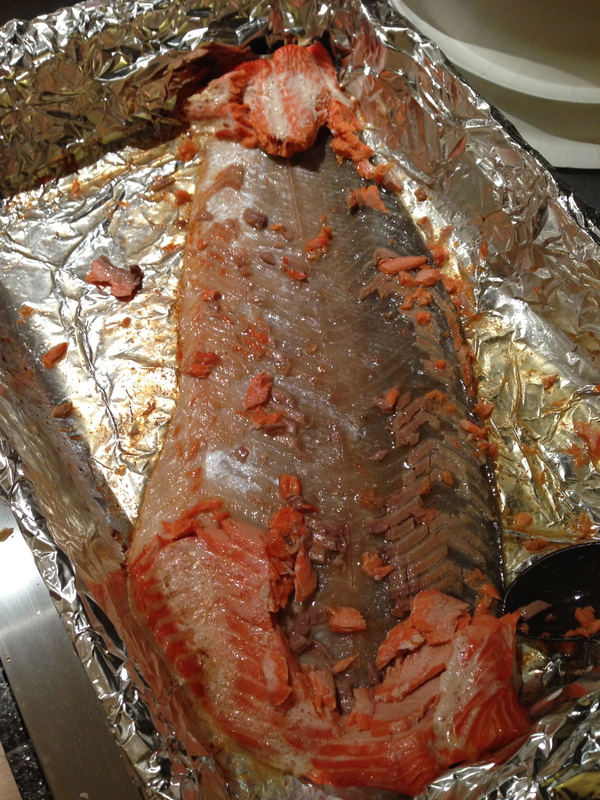 Off season, I have tried Coho and Miso’d that baby up under the broiler. It was ok but nowhere near Copper River Salmon. And I do not like fish bones….too gaggy for me. And though there may be some who will think I’m being blasphemous, I do not care for King Salmon, even from the great and good Copper River. Now, my dear Tom, who spent a summer in his youth, working in Alaska and the fishing industry; he who has told many a midnight of the sun story, has got a partner to share his love of his favorite fresh fish. We do enjoy sharing what we love best with the ones we love best! In briney bliss, I salmon sail and venture forward culinarily! But only in Copper River Salmon Season. They say they are waiting. Today begins with gratitude for the sleeping bag which kept me warm through another very cold night on the floor and warm thoughts of this day being a good friend’s birthday. Each day since the hurricane hit with the wallop of a wrathful giantess, is filled with contrasts like this. Yesterday, in bitter winds, we could only work for minutes instead of hours; trying to salvage and clear out the debris at the house. After locking the proverbial barn door and driving away, I see in my rear view an unfamiliar car go past and stop at of what’s left of my front doorstep. Turning this one surviving car of two around, we find it is a surprise visit from the FEMA inspector…one of three adjusters needed to move forward into the healing phase of this disaster. He says he has been calling for days and always getting a busy signal, hence the ‘just showing up.’ Later we find that he has been calling the house phone which is now underwater. It turns out that Wally is from Tennessee, plays bass and has a wife who is a singer/songwriter much as myself. Go know how these common threads are woven music in the cacaphony of this aftermath chaos. When we finish with the inspection; having been fortunate to only spend an hour and a half or so on line at the closest gas station, there is now enough fuel to hot-foot it to my son’s place several towns away for a much needed hot shower. He has just gotten his electricity back on in the middle of the night. It is like this in each day…part death/part resurrection. Positive surprises appear from buried beneath the rubble of what was once home..safe haven. Masked, as we muck out sea slime, sand and mold, little treasures present themselves, usually at my brink of breaking down. In the middle of a putrid pile of rotting raiments thrown out of wardrobes to a watery carpeted grave, I spy a small patch of yellow ochre…an envelope, addressed to my dear Tom in my mother’s flowery, handwritten script. Gingerly, I slip the barely held together wet message holder out from under and open it ever so carefully. Inside is a note, saying, “I know your party for Florence’s 60th birthday will be a wonderful surprise. For the photo board you are planning to present, here are some pictures of her when she was a little girl,” and out fall a handfull of images from my childhood…not a drop of water on any of them! In another room, filled with piles of paper flipped out of filing cabinets, a single sheet bearing the poem paying honor to my brother, Owen, at his passing, slips forth with words not only my own imprinted there…but the cherishment for him from those who loved him, still do and always will. In the corner of a dresser drawer, filled with seawater, I spy a glint of gold in the depths and fish out a small, 24 karat locket and chain my mother used to wear. I always thought there were pics of my sister and I within. I open it delicately to find her Mom and Dad, my grandparents, smiling up at me; pretty and handsomely youthful; two immigrants who came to America to make new lives; finding each other and raising their first-generation family in challenging NY’s Hell’s Kitchen. There they are, these two…so dear to my mom, reminding me what is most important..that one can lose all possessions yet still posses the timeless treasure of unconditional love. The ocean roared, in wrecking the world as we knew it; wiping out a populace, home and hearth, safety and normalcy. No electricity, heat, plumbing, potable water, gasoline and as if that weren’t enough fun, in blows a frigid snow and ice storm for frosting on a mile high sand dune cake. It is down to basic Neanderthal-feeling survival here. Some people give in to fear, greed and negative actions while many of the tribe gathers round the one occasional emergency generator “fire,” like times gone by, to share stories, warmth of company and perhaps a tangerine, a bag of goldfish, a handfull of almonds, water or some little treat for the impromptu potluck while everyone gratefully and agreeably takes turns charging communications devices until the one hour allotted power goes out again. Waves rose up, rolling over everything in their path, deluging homes, businesses, whole towns and roads. Structures broke apart; the beautiful boardwalk is in splinters, some parts left resembling the Cyclone roller coaster at Coney Island, while other sections are completely missing. Boats, launched and lurched from their moorings; scattered across flooded main roads and up onto lawns; looking like giant garden planters. Buildings and cars exploded in the night of walls of water and pouring-down, wind-driven torrential rains. Firestorms raged in the high winds; blocks of houses and whole communities torched to their hulls. From the 4th floor windows of my son’s apartment building to which we evacuated, we watched as red/orange flames rose sky high in the dark, like out of control forest fires. Transformers blew up blossoms of green to go with…the presentation of a macabre Grucci Brother’s July 4th-like show. And now that the ocean has trounced us good, in my home, there are, at receding tide, pools of starfish-like treasures the sea is giving up from her murky depths. One at a time..the deep sea, salvage operation prises a token from a time now gone by..almost like appeasement for the plank-walking demise she’s put us through. In the sifting; trying to save, we pay homage to the house… gratitude. I am moved each day between bone tiredness and tears as we toil away down to the Marshall law curfew; bagging and tagging parts of the body of this home which has, over the years, sheltered my family through many other kinds of storms. I am immensely grateful for her stalwart, savior strength of safe haven. This wounded warrior is in need of major surgery and we do not know yet if the patient can be saved. We hope it may be so.